It's coooooooold. Today's low was supposed to be 0 degrees but I woke up to -4. Best to just tuck in, bake up some tasty high calorie food, watch the birds at the feeder and when it's too dark for that, watch tv. I love The Learning Channel! Little People Big World is one of my favorite shows--I love it if for no other reason they're good parents. It's nice to watch a family actually work like a family. The mom on that show doesn't put up with any crap and the dad makes the coolest stuff for the kids to play on. I also bet they have some really cool birds on their property. I also love Miami Ink (gotta love a show about a bunch of hot artistic guys with a dream to make it big). If I didn't have to pay for my own travel I'd love to apply to get my next tattoo on that show. Both those shows have so much heart, everyone is passionate about what they are involved in. I have to say that watching a show about four morbidly obese people--two of whom are eating over 30,000 calories a day are really making me feel not so bad about days I eat over 2000 calories. Now the true Minnesota winter has set in. Yesterday was a gorgeous sunny day but in the teens with stinging wind. We took a walk in it, being fooled by how cold it really was since the sun was out. 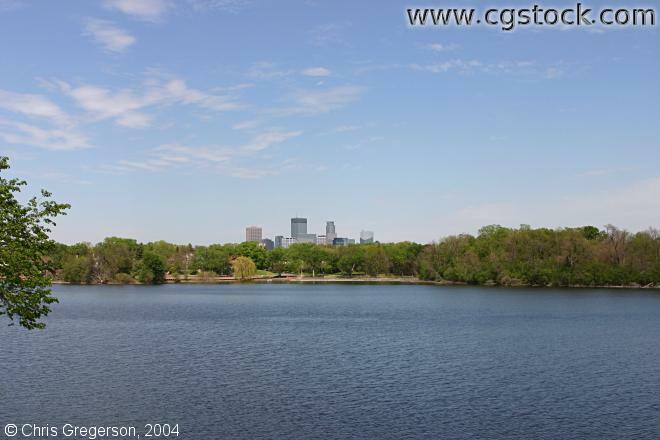 Above is a photo of Lake of the Isles not too far from where we live. It is completely frozen over and is a playground for cross country skiers or any of us who just want to walk around on the lake and get a closer look at its islands. Many of my friends are down at the Space Coast Festival in Florida. I have deadlines and couldn't make it there this year. I will not think of the warm temperatures, ocean and oh so cool birds. Really, I won't. This is an old osprey platform on one of the islands on Lake of the Isles. You're not allowed to get on the islands, they are a preserve. My owl senses tingle every time I go by, but the islands have so much brush, I don't know how far I would get onto them even if I decided to ignore the signs. In the summer I'm sure they are loaded with all kinds of breeding birds. You can't see it at this angle but this osprey platform is surrounded by taller trees so the chances of it being used by osprey is very slim since they like the nest to have good visibility from all sides. As I understand it, the people who lived around Lake of the Isles when the platform was put up didn't want the platform to be taller than the surrounding trees for aesthetic reasons. Sigh. I'm not sure how, but I managed to coax Non Birding Bill out on the ice with me. I think he would rather not have been out, but since I was going he wasn't thrilled about me walking on ice by myself (no matter how deep it is) and didn't want me out there alone. My favorite part of the frozen lakes are the ice sculptures that people put up. Here we have a sweet dragon sculpted on top of the ice. That is one of the benefits of living in an artsy area, the local artists are happy to use the frozen medium. Here's a head on view. Happy Dragon. When it gets this cold, you use any sign possible to remind you of warmer months in the future. Note the two starlings above. The starling on the left has fewer spots than the one on the right. It has already worn out most of its winter plumage. Even the bill has gone to being mostly yellow instead of mostly black. This bird is ready for spring. Maybe a little too ready, it's not even February yet, but I love an optimist.